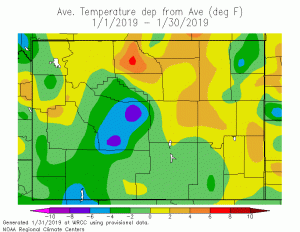 Star Valley experienced generally about average precipitation in January 2019 with a couple of cold spells, one around the 1st and then toward the end of the month. The coldest reported temperature was the -27 on New Years Day at the Double L Ranch northwest of Etna. This was one of 16 days at the Double L when the temperature dropped below zero. 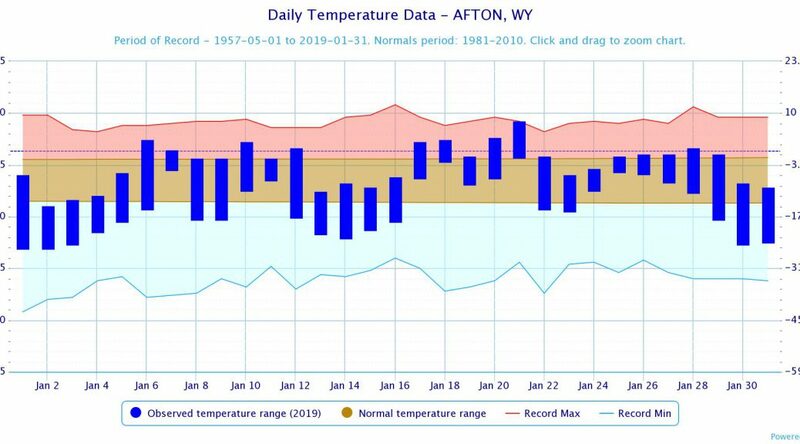 In contrast Star Valley Ranch station only reported 5 nights with below zero temperatures, the coldest of -10 on the 2nd. The Star Valley Ranch observation site had the greatest precipitation and snowfall with 2.63 inches and 38 inches respectively. The Bedford 3SE site was close behind with 2.25 and 35 inches of snow. Afton was the driest with 1.61 and 18 inches of snow. The Smoot 5SSE station measured 2.19 with 31 inches of snow. 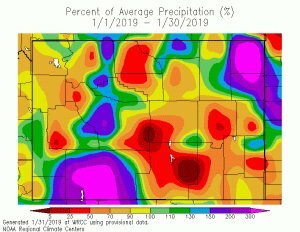 Wyoming precipitation in the month of January 2019 varied considerably. Lincoln County including Star Valley was around normal.